Electabuzz Emerges! Pokemon One a Day! Tron meets Pokemon? Sorta, kinda! 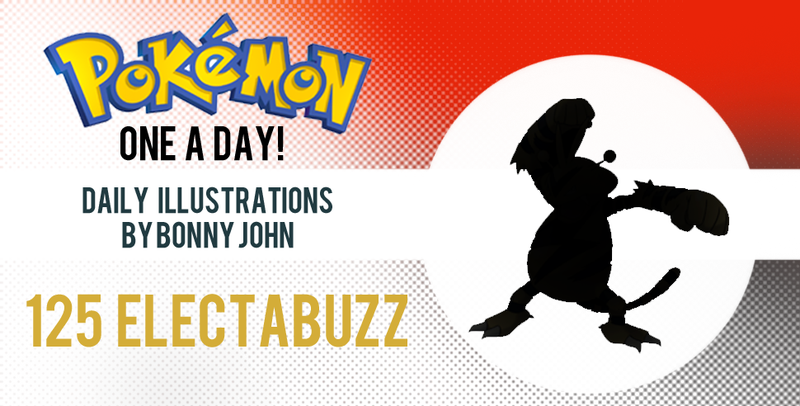 Welcome to today's illustration featuring Electabuzz on Pokemon One a Day! As I was saying with Burton x Mr. Mime, today's work more so embodies design elements resembling its influence more than parodying it. Electabuzz was treated in a way to carry a black silhouette with bold, striking patterns in yellow to feature quite a punch visually than its traditional look. 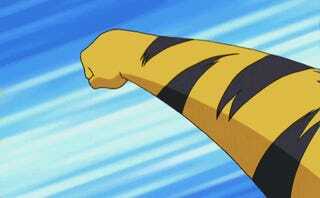 Electabuzz stands as sort of a vigilante or hero with this intimidating pose and demeanor. This is a Pokemon who's design for illustration was long cemented quite some time ago. As an electric type, the creature is dubbed boringly enough the "electric pokemon", and embodies the Tron-like aesthetic than any other Pokemon. You could argue Porygon as he is a man-made entity that can travel in cyberspace, but I see Porygon as Windows 95 more than futuristic Tron Program. So yeah, slowly, this character was being designed to be sort of a saturday morning cartoon hero that kids in the Pokemon universe all adored. The centerpiece is obviously the large thunderbolt in the middle, which sorta resembles the chestpiece of the DC superhero Shazam, which was totally unintentional and noticed sort of last second. The original Electabuzz shows no subtlety with its striping patterns in that it too also highlights a stylized thunderbolt on its body. One of the reasons why the thunderbolt is so prominent is obviously the coloring of yellow on black, but also how it sits on the chest - my Electabuzz was illustrated in a way to be top-heavy and buff, opposed to the bottomheavy beergut of the original. The piece otherwise is very straight forward - I added a number of design choices to reflect the futuristic tone in the form of the "decals" that I thought best fit this work. I worked very flat with a few strokes to add some definition here and there. Finally, I would add a glow effect throughout to bring energy into the yellow and really make things shine. So, what do you think of the work? Thanks for taking a look at Electabuzz - he was fun to work on as each iteration and draft ended up with a better "sculpt" at the body and details that are so prominently visible with this take. Hope you enjoyed the work and I shall see you tomorrow with everyone's favorite fire-breathing...duck...lizard...thing! +Click here to visit my personal website! It'll direct you to my YouTube, FB, Twitter, DeviantART, and Tumblr pages!